After a five-year hiatus, the Alice F. and Harris K. Weston Art Gallery turned its compass to the northern side of Cincinnati to revive popular studio tour/art walk North By Northside. On May 18, 2014, event organizers Dennis Harrington and Kelly O’Donnell produced a rare opportunity to experience a comprehensive look at the visual arts in this eclectic community that has emerged along the Hamilton Avenue corridor. Northside—a residential and industrial neighborhood—is comprised of an immense stock of stripped down, no-nonsense spaces, which, encourages artists to flourish within every nook. Northside is a community where the unexpected merges with the idiosyncratic. The voice of acceptance can be heard throughout the neighborhood. Perhaps not quite a mini Williamsburg (NYC)—a frequent comparison that is admittedly a bit of a stretch—the lack of corporate influence and the uncommon and highly creative use of space is a breath of fresh air here in Cincinnati. In Northside, there is also a feeling of the deep Appalachian and German roots that seem to influence the work created within this distinct locale. 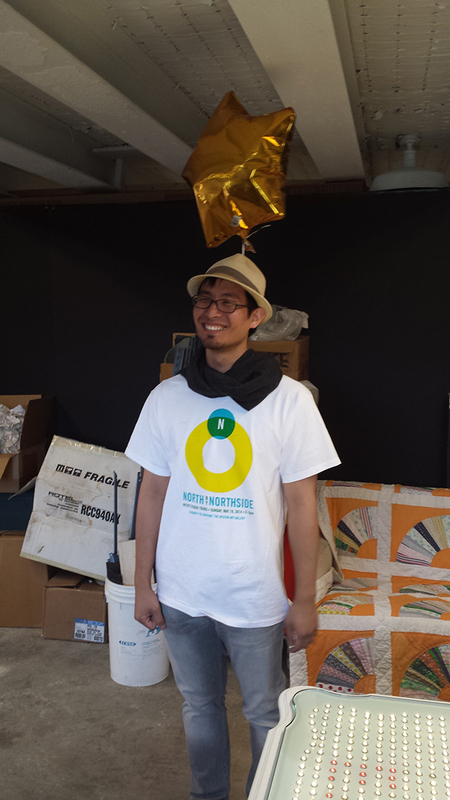 North By Northside showcased the area by offering an unparalleled opportunity to glimpse into artist studios, storage units, galleries, not-for-profit organizations, and other places and spaces. The occasion also rendered notable views. While touring, it quickly became evident that the visual arts fill the splits and cracks in nearly every surface in the community of Northside. 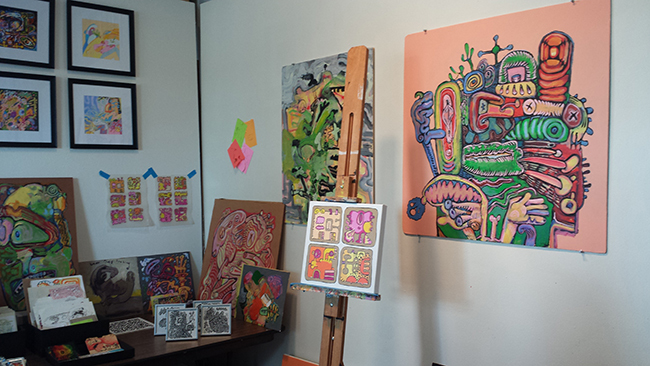 Kip Eagen curated a show called Pop-Up 45223, at Hoffner Lodge, a historic Hannaford building and former Masonic Lodge, which now serves as a centerpiece for the neighborhood. Eagen’s show successfully integrated a diversity of artists from both traditional to conceptual, as well as artists at different career points, in this tight little exhibition. Eagen’s selection of artists included Ballard Borich, Stuart Fink, Shawna Marie Guip, Maggie Tomshany Kelley, Matt Lynch, Tammy Malone, Jonathan Sears, Paige Wideman, Paige Williams, and Curtis Davis from Visionary and Voices, all whom work out of studios in the neighborhood. Veteran artists Ballard Borick and Stuart Fink displayed a high level of material excellence and finely tuned craftsmanship. Fink’s series of three works presented on a flat-white platform displayed toy-like wood constructions set atop wheelbases with vertical, whimsical repetitive forms. Fink created a triad of sculptures that referenced houses and vehicles in both a playful and a transient manner. Borick made use of highly refined and impressive Plexiglass frames to create a triptych—entitled “Bubbles”—that used a spectrum of horizontal bands of color with a large, organic blue line interrupting the space between the panels. Borick’s largely formalist approach left a gestural stain of watercolor to function as a horizon line across the empty white paper background. Two standout, high relief artworks by Shawna Marie Guip were featured directly across the small shotgun space. Both achromatic works incorporated sculpted porcelain forms in clusters that were set in front of a cold, steel plate background. 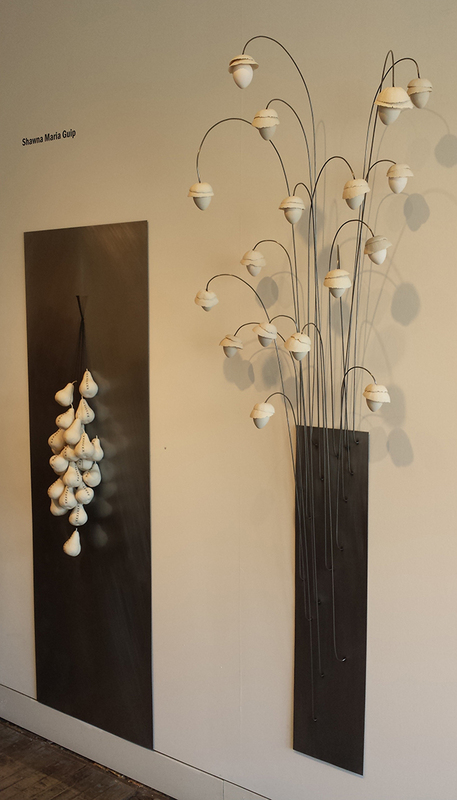 Guip’s work—entitled “Sterile Blossoms”—offered a grouping of porcelain blossoms rising on the end of a thin steel rod that climbed vertically and gently arched downward with repeating wilting egg shapes on end, evoking female reproductive thoughts. The coldness of the materials communicated detachment. In this modern age, it is perhaps a nod toward the sometimes-dispassionate process of clinical fertility. One of Northsides’ largest complex of studios is situated several blocks west of the Hoffner Lodge. About Space Studios is often overlooked as a visual art space, due in large part to the expansive presence of music practice space within. Several floors of visual art studios quietly exist behind the metal doors. Four floors of studios featured work by Claire Darley, Katie Demske, Linda Einfalt, Richard Fruth, Bukang Kim, Rick Mallette, and Alice Pixley Young, amongst others. I began my visit at Rick Mallette’s studio, on top the floor, where I found a wonderful offering of abstractly rendered figure clusters. While I am certain that Mallette tires of the obvious comparison of his work to Phillip Guston’s, it is nevertheless fine company to be among. I then went to the third floor and discovered Alice Pixley Young’s newly relocated studio. I was delighted to find fragments of process rather than a staged studio. Above a table, were scale drawings, maquettes of hand mirrors and collars, that Young eventually casted in glass for one of her recently completed works. It was lovely to see the thought process, repetition, and planning reflected in her sketches. It put the artist’s hand into the material development, an element that is sometimes lost in the fabrication of an idea. Building on the materialism on the third floor is painter Bukang Kim, who is one of the few established Asian artists in the Cincinnati area. The Korean born artist is known for her calligraphic expressionism and is well established in many collections including the Cincinnati Art Museum. Amidst the landscapes Kim displayed several older works of large interior paintings that function more like drawings utilizing a limited palette with greater concern to what the paint is doing on the surface than the interiors themselves. Then I visited Linda Einfalt’s studio on the second floor and viewed a series of manipulated collections assembled into installations and sculptures. One particular work presented wilted plant fragments of Knight Blooming Cerrus Flowers hanging from wire in a large but organic swooping cluster. However, the collection of materials did not stop there. Burlap bag fragments with cast starched circular forms and woven elements that were being staged for the construction of a larger piece were located both on the floor and on an adjacent wall. Directly across from this cluster was a massive rope. The rope was suspended, in two parallel lines, and were frayed on the painted gray wood floor. 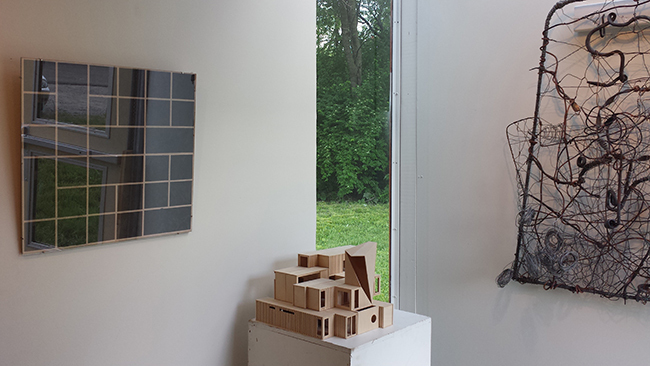 Richard Fruth’s studio of minumental sculptures is also on the second floor. I first saw a well-dressed workspace with a tidy woodshop surrounded by tools and storage. 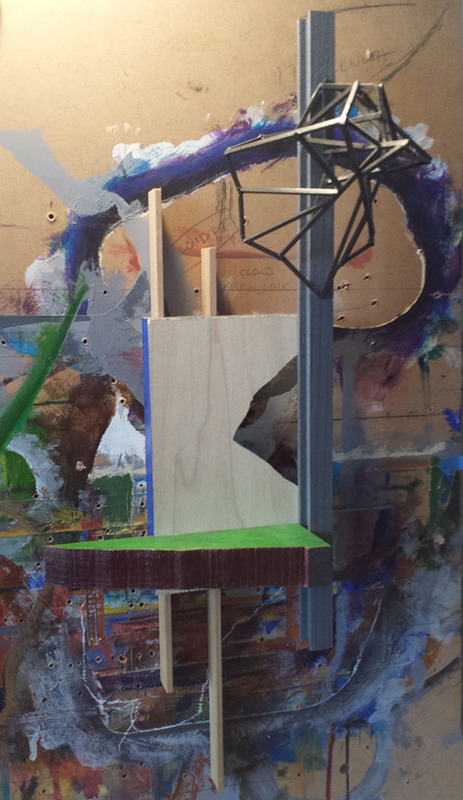 At a closer look I began to see delicately constructed wood assemblages, painted brightly with solid flat acrylic paint and stained wood, located at different ends of the studio. Fruth’s bronze cast figurative elements are the main focus of these small artworks and are the protagonist in each little narrative. Upon leaving, I noticed a high relief artwork that had an island like ground with a green painted top as well as a three-dimensional geometric framework made of Balsa wood set above several pieces of intersecting vertical planes. The piece was obviously mid-construction and was displayed upon a colorful background. Fruth uses these backgrounds “to paint all of his models.” An amazingly beautiful juxtaposition emerged, one that could only be revealed in an artist studio. Cincinnati’s center of blacksmithing and forging is headquartered in the Smithhaven Studios, about four blocks west on Blue Rock Street. Artists Christopher Daniel and Blue Hell Studio, Mark Gilsdorf, David Hug, Kristen Kieffer, and Eric Tayce have studios inside the industrial building. A smiling Kelly O’Donnell greeted us as we entered the building, where we saw Christopher Daniels, in the parking lot, hammering away at a piece of cold-rolled steel on an anvil. The complex’s garage doors opened to Daniels’ large workspace, which was wonderfully laid out. 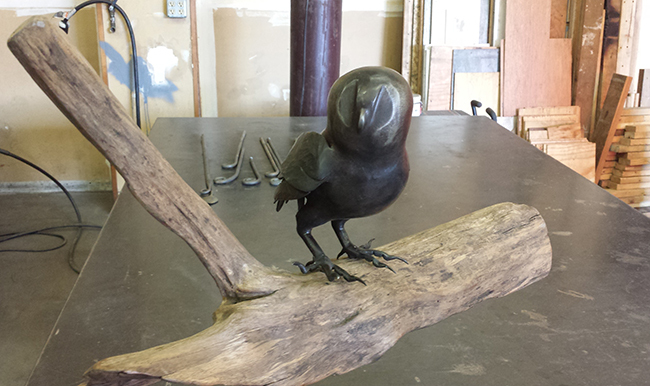 My companion called the space “a dream studio.” A number of finished sculptures were displayed on tables surrounding Daniels’ live forging demonstration; a stand out piece of a casted and forged owl was perched upon a piece of driftwood. 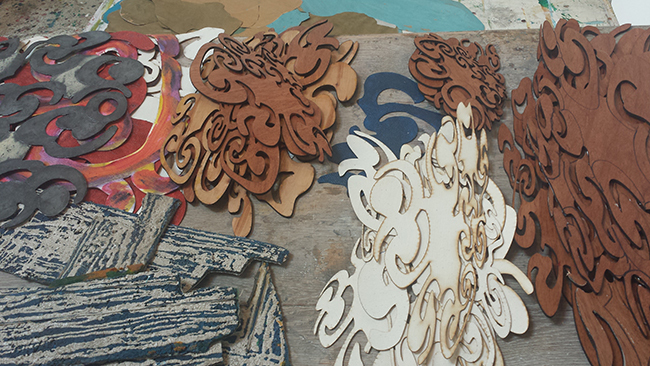 Two sample boards display the words “Blue Hell” in different metalworking samples of twists, turns, and bends that show off the many decorative sides of what Daniels is able to accomplish. Next, I found Mark Gilsdorf’s studio and another forging demonstration that was in full swing. Gildorf, a former student of Daniels’, has established a hand forged ironwork workshop. Many excellent samples were on display on a metal table. At the back far studio, a rather large cast figure was hanging down from the ceiling from an industrial hook. The figure had a ring for suspension on the back part of the head; the face was turned in a distressed gesture and twisted away with arms that cut off at the shoulder. The pod-like figure is wrapped in a cocoon shape. It reminded me of Last Conversation Piece by Juan Muñoz, which is placed outside of the Hirshorn in Washington, D.C.
Frank Hermann’s stand-alone studio, where he has worked since the early 80’s, is one block North on Chase Avenue. Two large-scale, abstractly rendered juicy paintings were hanging on two long white walls at the entrance. Hermann’s work seems to incorporate both large organic churning shapes with landscape references, but also with figurative brain-like connections, within the patterning. The layers of painting history built up on every surface reflects Hermann’s long involvement with the culture of an isolated tribe in the South Pacific; his studio exudes a kind of “sacred space”. Cherl Pannabecker’s and Farron Allen’s studios are located diagonally from Hermann’s. 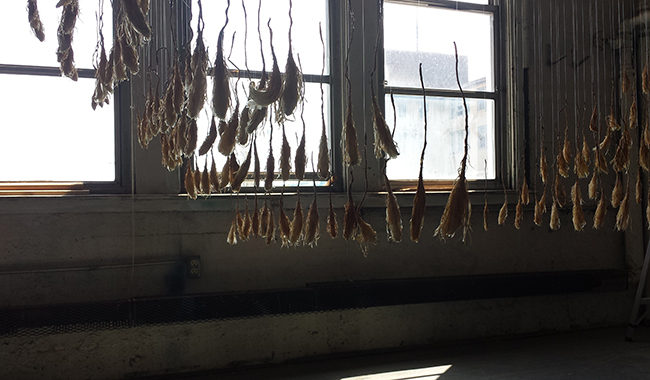 Pannabecker’s space presented delicate wall installations of decorative/natural forms that lightly danced over the walls. As I travelled to the back, Allen, by contrast, had a much more emotional and visceral grouping of works—mixed media often constructed with steel or cast elements—that extended into the garden and the basement. 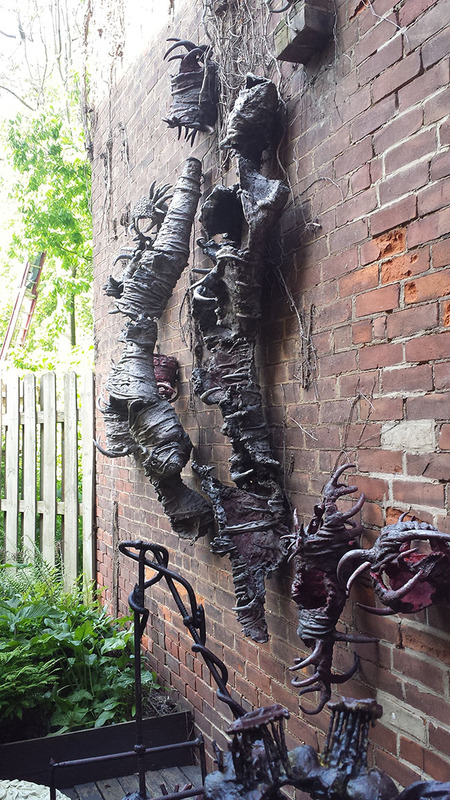 There was a unique grouping of partial figure forms hanging on the brick wall outside the garden area, wrapping the wall like ivy, and leading into a slightly overgrown grey garden that transformed the intermittently spaced sculptures into an interesting site-specific conversation (and was ruin like). The subject and the emotive aspects of the sculptures continued into the basement, but it appeared that even more chains, repeating nail/needle patterns, and red/warm color palettes, lent the atmosphere to a dungeon type feel. My favorite piece was a hanging collage of zip lock baggies with found objects and text that said “casual contact, giving head, bug, protection, average.” It seemed to just nail down the whole presentation and was perhaps the highlight of the entire studio tour. Artists Jymi Bolden, Denis Burge, Abby Cornelius, Margot Gotoff, Julie Lonneman, and Patrick Williams all have studios in Off-the-Avenue on Knowlton Steet. The building is another large offering of studios, perhaps the most collage like arrangement of space, and truly could only exist in Northside. Margot Gotoff’s glass studio with its large glass ovens is on the first floor of the building. 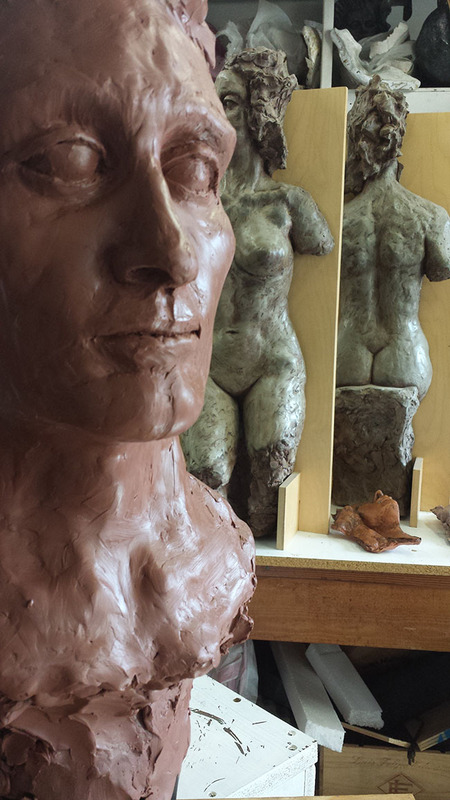 Her work shows the integration of classical sculpting methodologies of clay rendering of the figure and the casting processes (with a twist of the contemporary). The studio was beautifully layered with process. Figures of positive clay forms, negative wax castings, newly cast figures being revealed out of molds, and others waiting to be cast are a materialist dream. Denise Burge’s studio is on the second floor in the back. 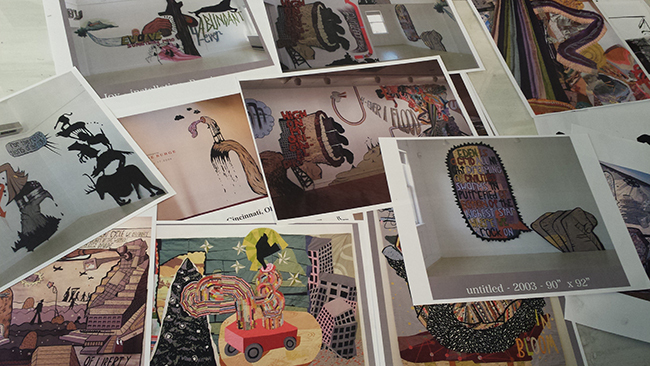 The work on display consists of staged collage works that integrated digital prints, found objects, and quilting. The photographs on her table indicate her interest in larger conceptual pieces for installations/site specific work; they also integrate text. Next door in Abby Cornelius’ studio is a noteworthy collaboration with Burge called “Cutting through Spiritual Materialism”, which weaves together conceptual ideas into a series of mix media works. Something really raw about the studio collaboration felt authentic and unforced, like a loose drawing. The work to the right of the entry, “Ok Crush,” is an installation of a book. 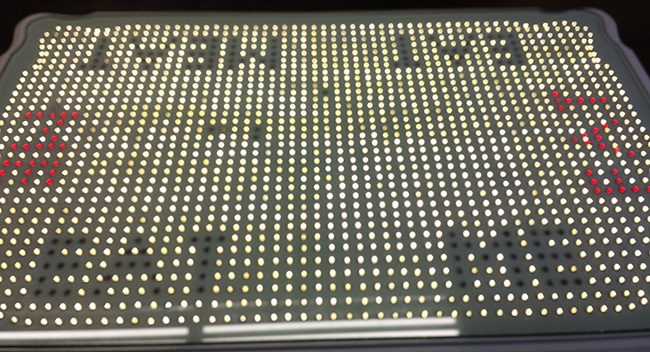 Two crushed Ativans, spelled out the word “OK” on top of gray gridded wallboard, and a sequence of looping films of “crushes” on a flat panel sit upon a square mirror base. Artworks Garage, an unassuming complex on the rear of a parking lot is directly across the street from Off-the-Avenue-Studios. Sculptor Matt Kotlarczyk’s studio is underneath the Artworks space. Multimedia works and light boxes were stacked up around the space. The central piece there was a table with LED’s and switches that spelled out “Eat Me” and “Eat Meat” that flashed intermittently. The location beautifully opened up to the back alley and faced the American Can Building. With the new development slated for the future of Northside, I look forward to visiting this space again once it is more established. I walked across the field in front of the American Can to visit PAR-Projects’ Jonathan Sears and his new Makers Mobile space, located on the east side of Blue Rock. This shipping container project space and temporary exhibition gallery had a colorfully painted exterior, completed by Higher Level Art. Inside was a group exhibition, “Provoking Conversation,” with works by Shane Gilmore, Dan P. Moore, and Adam White. The wonderful piece by Adam White utilized text inside the container and not only embodied the title of the exhibition, but it also worked best in relationship to the steel ribs of the shipping container space. At a distance, White’s grid of text bubbles layer together like a large-scale minimalistic work. At North By Northside, it was a pleasure to see the other side, beyond the not-for-profits organizations, and discover just where the individual artist finds his or her voice amid one of Cincinnati’s most eclectic neighborhoods. The Alice F. and Harris K. Weston Art Gallery, staff, and volunteers should be commended for being an organization that continually places the individual artist at the fore. However, I would be remiss if I did not mention the notable Northside organizations that support these individual artists, companies such as Happen Inc., Thundersky, Visionary and Voices, Prairie, Chase Public, WordPlay, and others just emerging. A shipping container, a small strip of land, a storage unit retrofitted into studios, an industrial building, and row houses that stitch the fabric of Northside are manifestations of this grassroots and unconventional creativity, which seems to make anything work. Northside is a tapestry, woven together by people who live amongst and cultivate diversity, allowing this community to thrive. North By Northside was a tremendously successful showcase of this neighborhood’s artists, talent, and supporting assets.